We generally use online translators to convert sites from one language to another, If it were a wordpress blog you can make available your blog in different different languages without the user needing to translate your blog using online language translator tools. 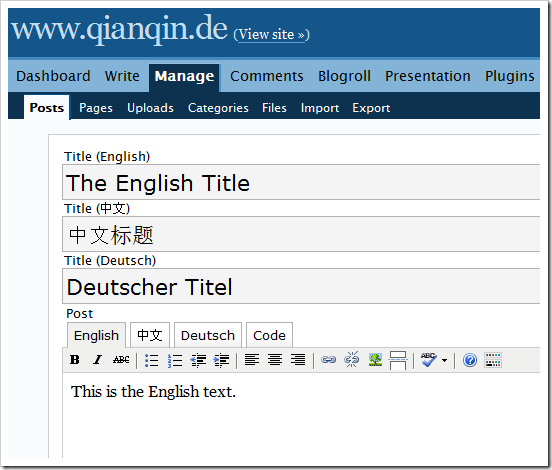 qTranslate is wordpress plugin that does the work of your blog translation and provides buttons to access translations in each article. 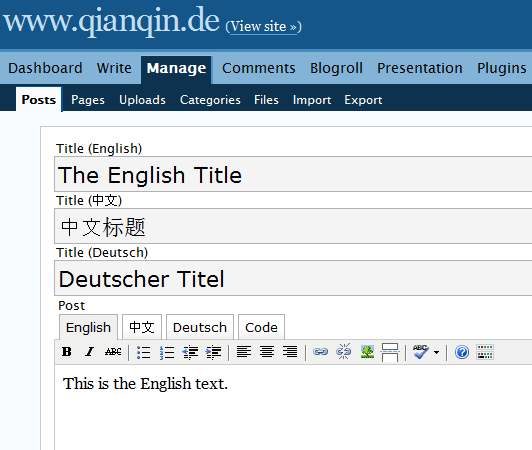 qTranslate currently comes with 4 languages already builtin – English, German, Simplified Chinese. You can also add a new language to the plugin by entering the 2-Letter ISO Language Code. Check out the Installation guide on how install the plugin. Check out the FAQ Section for any doubts. NOTE : This plugin makes changes in your wordpress database ? Yes, it does. When you access the Configuration page, it will check how long category names can be. WordPress’ default length is 55 characters, which is too short too handle multilingual content. Thats why qTranslate will change it to support up to 255 characters. It won’t alter the database if you already changed it to a different type like text to support even longer texts. If you want to try this plugin, I suggest you first try it out on your local installation of WordPress and then on your live blog. Useful to people who has difficulty in understanding english, but not to Indians. Nirmal » You’r right , but just another feature so that visitors don’t leave just for the reason that they can’t read the language. i’m sure it’ll be a great boost for various bloggers in various countries…I wish if they can extend it to include indian languages too. ReviewSaurus’s last blog post..SequoiaView helps in freeing the space on hard disk! Interesting find there…is there any demo site using that plugin? Shashank » Shashank qtranslate homepage is using the plugin, there is a Dutsche version of the site, click the flag to see the translation. These language plugins are really useful to bring your site/blog to broader level of audience that can’t understand English. Jawwad’s last blog post..How to Block Internet Access of the Windows Programs without Using a Firewall ? Hm.. Are “Simplified Chinese” two languages really?.. @Dmytro: you can check out more about simplified chinese at http://en.wikipedia.org/wiki/Simplified_Chinese_character . We can also add more language support to the plugin. is this plugin helps to post indian language too.. This is a nice plugin. I have no problem in translating the post or pages in WP. But i am really facing problems in translating when those data that are coming from WP widget area in sidebar. Can anybody help me..? nice plugin but this plugin is available in only four languages.I have an indian recipes website (http://indianrecipe4u.com)in english and i want to post in telugu also because it is indian recipes site and it will have indian dishes.I just want a plugin for telugu language. can any one tell me how can i do that .Thanks in advance.